Casting my eye over recent nominations for North East promoter of the year, I found myself feeling a little nonplussed. Sure, the nominees are worthy but there’s a glaring omission in my eyes. Endless Window programme some of the best, and most varied, line-ups in Toon with unerring regularity and deserve to walk off with a massive trophy at some point in the future. This month is no different as they bring another eclectic and exciting bill to their spiritual home at The Cumberland Arms on Friday 19th October. Top of the heap are The Unit Ama, playing their first headline Newcastle show in four years. 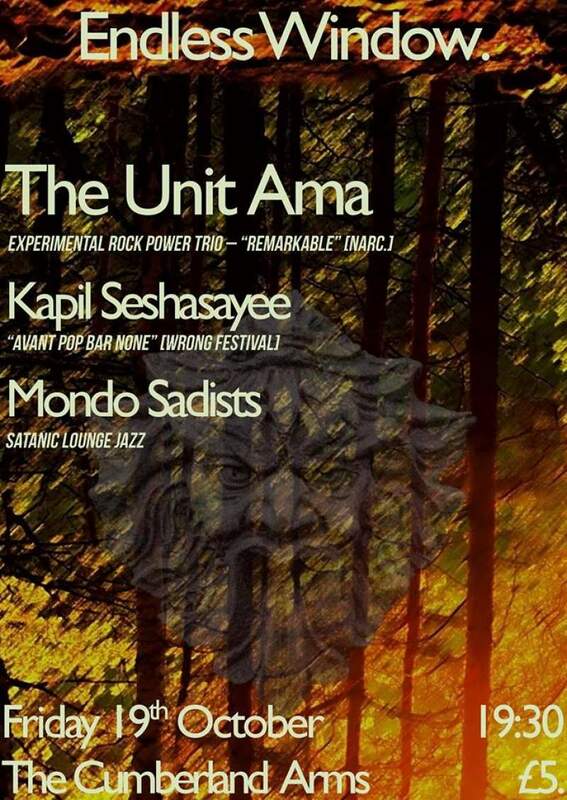 A band that has legendary underground status in the UK and further afield, The Unit Ama play devastatingly incendiary avant-rock; a whole lot of sound comes out of this trio that features members of The Horse Loom, The Long Lonesome Go, and Archipelago. Also playing on the night is the astonishingly talented Kapil Seshasayee. Described elsewhere as ‘a one man combination of Scott Walker, Mark Hollis, Bjork and Richard Dawson’, you’re unlikely to find a suitable pigeon hole for this guy. Mondo Sadists kick things off with their surreal free-jazz influenced noise rock, displaying all kinds of wildness and carnival-ride-gone-wrong melodies to get your night out started right – or gloriously wrong.